#177780 - 02/07/19 09:20 PM Check out this oldie! I saw that knife . The Stag looks Brand New . Not like a 1940's piece . The Hilt does not seem right ? The sheath has Large Throat rivets and i have been told those are post WWII ? The grinding of the blade looks odd . The top part was ground into the Randall stamp . Could this be a put together piece ? I do not know nearly as much as most of you guys , but something looks off ? Well, now I'm curious. Any thoughts, Joe? that is definitely one I would need to see in hand. My first thought was that it was a Fantasy piece. I have never seen the sharpened upper part of blade end so deeply/abruptly and into the Randall logo . The knife blade was obviously cleaned up and/or reground . No way a 70+ y/o blade is going to look like that . Hilt appears too new and possibly may have been a double hilt with top part ground down ? Top part of hilt does not end like other pics of knives i have seen from this era . Seems like an abrupt end . Spacers look like they belong on a leather handle knife . Usually WWII stag have the 7 spacer set up . They also look brand new . The stag looks brand new . Has appearance of a modern piece . I believe the White Tail deer are usually seen on WWII pieces ? The double pinning looks a bit off and too close to the hilt ? Appear like new pins ? The Heiser Sheath with large throat buttons i have "usually" seen on post WWII knives . A LOT of red flags on this one . I know many of you guys are much better suited to give opinions , but to me it appears to be a put together piece ( fantasy pice ) . Some of the knives were made with stag handles. 2 guys apparently were making these knives. Bo Randall and Bill Platt. 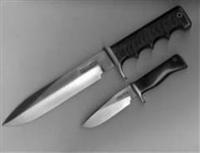 From what I understand Bill Platt had small hands and therefore his knives had smaller handles, while Bo Randall's knives had a larger circumference because his hands were larger. I hear that each man had a different idea of what one of these Hunters should look like, and therefore there was grind experimentation. From what I have read there was very little consistency from knife to knife and almost every Hunter was a "one off" in one way or another. In the Gaddis book it states that the Hunter hilts being cut off varied from knife to knife. Gaddis also confirmed handle inconsistencies varied from knife to knife. I am not an expert, just FYI. Does anyone have any idea how this gentleman acquired this rehandled/reground knife without knowing that it's had been? Click for 3 pages written by BoBlade regarding the "Hunter". Generated in 0.019 seconds in which 0.005 seconds were spent on a total of 15 queries. Zlib compression enabled.